Dr. Gross earned her Bachelor of Science in Health Studies from the University of Miami in Coral Gables, Florida. She graduated with honors from Nova Southeastern University College of Optometry in Fort Lauderdale, Florida with her Doctorate of Optometry. Following graduation, Dr. 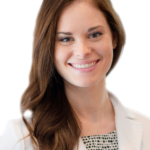 Gross completed her residency training at the VA San Diego Healthcare System, where she gained extensive clinical experience in ocular disease, traumatic brain injury, and low vision rehabilitation. Here at Gordon Schanzlin New Vision Institute, Dr. Gross specializes in the diagnosis and treatment of dry eye conditions. There are many new treatments available for dry eye disease, and a thorough diagnostic examination will determine the cause and treatment options to help reduce or eliminate the discomfort and symptoms of dry eye. Our Dry Eye Center offers some of the latest advances in treatment.